Michaels: I think what happened was it was a period in the show’s history where [the] critical community and the network were on the same side, which seldom happened. I think Don Ohlmeyer was running the network then. We were getting killed in the press. We were in a transition away from the baby boom. And people like Sandler and Farley and Spade and Mike Myers were just leaving, and Dana just left. And so there was sort of consensus. New YorkMagazine ran a cover on Farley – why these people weren’t funny. I think Don Ohlmeyer felt it as well. I kept saying they’re not playing to you; they’re playing, pretty much, to your kids – that we were in the middle of a change. At the time … everything then was compared to the original cast, and did they fit, did they measure up. Of course, the idea that they were listening different music, that they were from a different time didn’t get through. And, as I said, the critics were really fierce and ratings were starting to suffer … And also the movies were beginning to work – Tommy Boy was ‘94, or we shot it in ‘94. And I don’t think [Don Ohlmeyer] was a fan of Norm MacDonald. But I was, I am always looking for what I think are original voices and, I thought, I wouldn’t have met with you if you didn’t think you had one. Maron: So it was not a – so it was just not my year. Michaels: No, I think we were being pounded on a whole other level, which was really existential at that point. Critics were [saying] “Saturday Night Dead.” The network was “you have to change, you’re too set in your ways.” And the simple fact that different generations come in and make the show their own and they find their own way of doing it, within the same tradition, as opposed to blowing it up and starting over. And the thing about broadcast is that you’re on in all 50 states. In the way that the railroads united the country in the 1900, I think the networks did in this century. You know the show plays differently in Arkansas than it does in Hawaii. Maron: Maybe I wasn’t right. Michaels: No, no, no. You were fine. Michaels: You had a strong point of view and you were clear. You were just part of a mix. There was no idea of so much replacement, as you can only do that gradually. It was whether or not to bring you [on]. 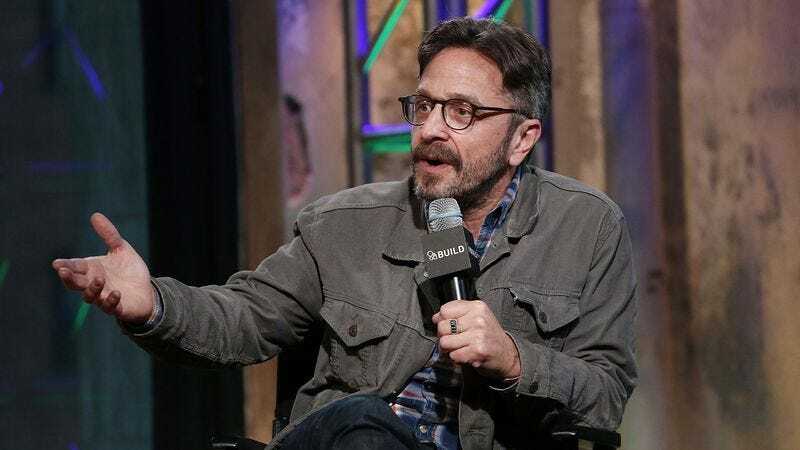 Maron: In retrospect, I don’t know if I was necessarily ready for the show and I came in here. Michaels: You needed to spend a certain amount of time onstage to be ready for the show. I think you were ready. I think it was, I didn’t have – I learned early on that if you bring people in and there’s no real spot for them. Spade, I think, when we did the debate with Bush, Clinton, and Perot. Dana did Bush and Perot. And David was in the wide-shot filling in for Dana, dressed as Perot, so if you see the three shot of them, it’s actually Spade because Dana can’t be in literally both places. But once we cut in, it’s Dana again. So it was just tough for David to catch a break, because Dana. Writers will always go with whoever came through for them on the last show. And so they will go with the performer that they know can deliver and it’s just harder. Unless you play some other kind of part or unless you bring some other kind of voice that’s clear and can withstand those first five or six shows when the audience is less than friendly.